The Museum is found in the attractive Victorian building that formerly housed Covent Garden’s famous flower market. 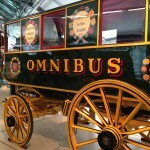 Inside, there are three floors of exhibits – from the sedan chairs and horse-drawn hackney carriages that represented the earliest forms of public transport to twenty-first century tubes, taxis and buses, along with posters and other London transport related paraphernalia. 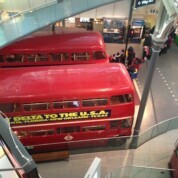 You can sit inside many of the train carriages and climb onto the top deck of many of the double decker buses. 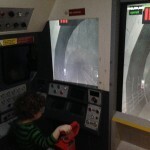 MJ particularly enjoyed sitting in the driver’s cab of a modern bus and pretending to drive a Jubilee Line tube train on a simulator. At first glance this seems like a small and relatively expensive museum for a day trip. 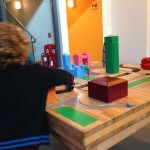 Once inside, there is so much to capture a small child’s imagination that you’ll easily pass a couple of hours. Although the admission fee might seem steep the ticket is valid for a year, so it actually works out as a great value destination if you live locally and plan a few return trips. Plus, the shop is brilliant for quirky gifts. Adults £15, ticket valid for 12 months. Children aged 17 and under enter free of charge. Concessions £11.50. Daily 10am to 6pm (except Friday: 11am to 6pm). 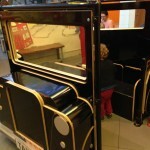 The London Transport Museum is fully accessible to pushchairs. There are good baby changing and family facilities. There are two café bars located at the Museum. The Upper Deck Café Bar is open every day and offers hot and cold meals (including children’s menu), drinks and snacks. The Lower Deck café opens only at weekends and in school holidays. There are picnic tables inside the Museum so that you can eat your own packed lunch. By train: Covent Garden (Piccadilly Line), Charing Cross (Northern and Bakerloo Lines, National Rail), Embankment (Circle and District Lines), Leicester Square (Northern and Piccadilly Lines), Holborn (Central and Piccadilly Lines).